Hot Sauce of the Month Clubs are, well… hot! A quick Google search for “Hot Sauce of the Month Club” will yield about 20+ hits on the first page alone. There’s no doubt that “Of the Month Clubs” are trending. For as little as $27.95 per month, you get 3 artisanal small-batch hot sauces shipped right to your door. FuegoBox.co never compromises on quality. You’ll not get gimmicky labels or insane heat hot sauces. Just the cream of the crop style hot sauces that are highly respected within the hot sauce communities – revered by chileheads and hot sauce reviewers. You can choose either a 3 month subscription or a 6 month subscription. They also offer a pay-as-you-go monthly plan, or a quarterly plan. FuegoBox.co allows you to pick and choose almost any aspect of your subscription. The only thing you can’t pick and choose are the types of sauces you get. Ok! Sign me up. I love surprises! What a great way to get delicious gourmet hot sauces delivered to you monthly, without the hassle of going online, searching for sauces and paying for shipping for each bottle. FuegoBox.co has free shipping! Founder Mike McAdams tells me whenever you sign up, you’ll start with Box 1 (Uno), and receive whatever that month’s box is thereafter. We received the first 3 months of FuegoBox.co for review, and the contents are stellar. 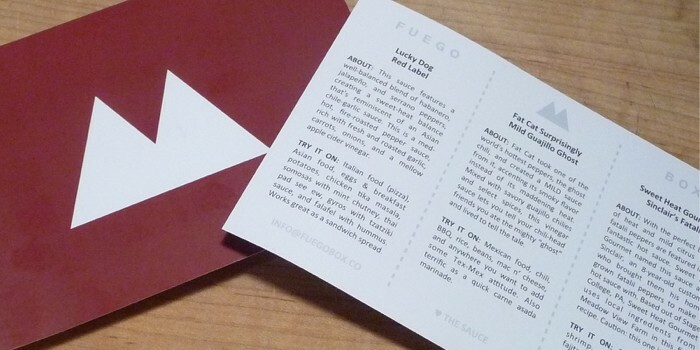 And each box includes a glossy postcard that describes the sauces and suggests foods to try them with. Cards to suggest the best foods to try the sauces with. 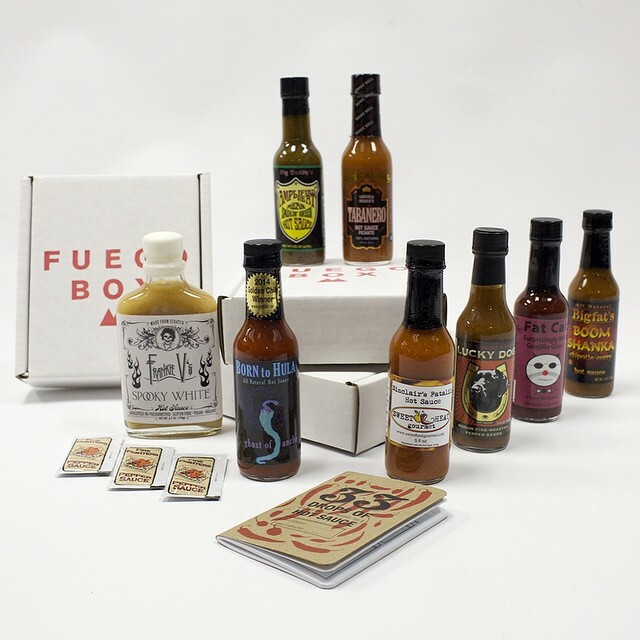 Box 1 – Uno – Includes Born to Hula Ghost of Ancho, Frankie V’s Spooky White Hot Sauce, plus the 33 Drops of Hot Sauce Booklet (a pocket sized journal to record your hot sauce tastings). 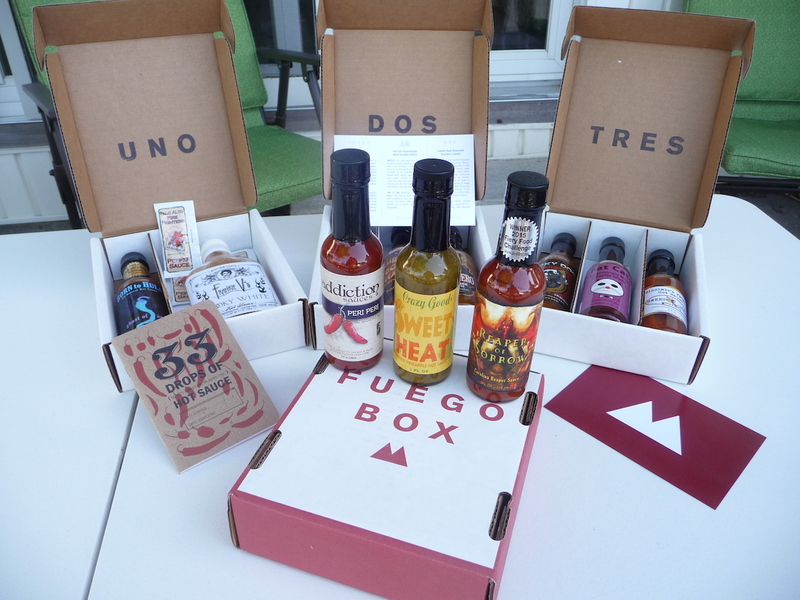 Box 2 – Dos – This box features Big Daddy’s Amplified Heat, Big Fat’s Boom Shanka, and Tabañero hot sauces. Box 3 – Tres – Has Lucky Dog Red Label, Fat Cat Surprisingly Mild Guajillo Ghost, and Sweet Heat Gourmet Sinclair’s Fatalii hot sauces. A great gift idea for your friends and family – or for yourself! Visit FuegoBox.co and tell them HotSauceDaily.com sent you! You can also follow them here on http://facebook.com/fuegoboxco and http://instagram.com/fuegobox.